Termite treatments must always be done in a manner that avoids damaging or contaminating water sources. Wells, cisterns and foundation drains can pose a challenge to termite treatments. Although these situations are difficult, there are options for protecting your home with some type of termite treatment. 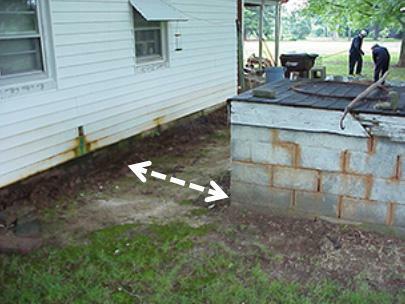 Some older homes have wells within (underneath) or near the foundation wall. Liquid termiticide labels and local building codes may prohibit or limit soil treatments when a well or cistern is located under or within a certain distance of a house (e.g., within 50-100' of private or public well, respectively). These restrictions are intended to prevent accidental contamination of the water supply (and local groundwater). The restriction applies even if the well is not in use or is not use for drinking water (e.g., it is only used for watering plants). A liquid treatment may be possible if the well/cistern is located outside, although there may be restrictions or special instructions based on the distance of the well from the foundation (usually greater than 5 feet from the foundation). Ask the pest control company to provide you with a copy of the pesticide label or you can look online for the product label so you know how the treatment must be done. Many people are familiar with product Safety Data Sheet (SDS) which contain information about the chemical's safety but they do not explain how to use the product. That information is found on the product label (and/or technical brochures from the manufacturer). (Note: Pesticide labels found online are not necessarily identical to the one found on the specific product being used to treat your home. For that reason, you should request a copy of the actual label from the pest control company). Most termiticide labels permit "treated backfill method." This tedious and time-consuming procedure involves removing the soil along the foundation wall (both sides of the foundation wall if necessary) within a specified distance of the well. 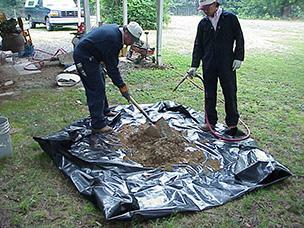 The excavated soil is placed into a wheelbarrow or on a plastic tarp, treated with termiticide, and then filled back into the trench along the foundation. A well can be legally "abandoned" and you can drill another well elsewhere on the property (IF the new well will meet state/county requirements). Abandoning a well does not mean that you simply stop using it or that you disconnect the pipe to the house. There is still concern that the well and groundwater could be contaminated accidentally during a termite treatment. For additional information, consult North Carolina Well Abandonment or contact your regional office of the Division of Water Resources of the North Carolina Department of Environmental Quality. Treating houses with wells close to the foundation can present problems. Treating soil to be backfilled along the foundation wall of a house. Subsurface or foundation drains (sometimes called "French drains") are used to prevent or correct moisture problems under and around homes. Many new homes have these drains installed during construction when the soil beneath the drain or backfilled on top of it can be treated in a way that avoids contaminating the drainage system. Problems can arise when drains are installed on an existing home. Digging or removing the soil along your foundation also removes any chemical termite barrier around your home. Most termite protection contracts stipulate that removing or disturbing the soil along the foundation will void your termite protection guarantee. If you are planning to waterproof your foundation and/or install a drain system, then call your pest control company before you start the project. 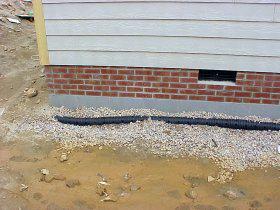 Foundation drains may go unnoticed during a termite inspection. If a pest control company is going to treat your house for termites, make sure that they know about the drain before they start any work. This will help prevent accidental runoff of the termiticide into your yard, a creek, ditch, pond or wherever your drain line empties. Options for liquid treatments on houses with foundation drains Prior to treatment, the applicators must take precautions to limit the risk of applying the termiticide into subsurface drains that could empty into any bodies of water. 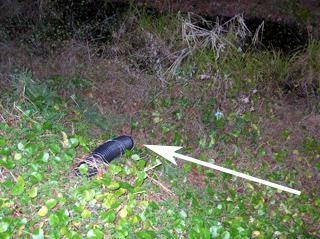 They must evaluate whether the application to the top of the foundation footer might contaminate the subsurface drain. When appropriate (e.g., on the side of the structure near a body of water), the "treated backfill technique" described previously can be used to minimize off-site movement of termiticide. Foundation drains are not usually obvious except during construction. Foundation drains may empty into dry creek bed, ditches, even ponds. For houses with a well or foundation drain (or both), an important alternative to a liquid soil treatment would be a termite baiting system. There are several bait products on the market and many companies offer only one brand of termite bait. If you think you would prefer baiting system, you should call several companies and ask about the availability (and feasibility) of using baits for your particular situation. Controlling termites in houses with wells or drain systems can be more difficult and more labor-intensive whether a liquid or baiting technique is used. Although this added or alternative work may increase the cost of a termite treatment, the environmental concerns justify it. The pesticide label is the law; don't ask or allow a pest control company to do otherwise. If you have a well, cistern, drain or other unusual situation under or near your house, make sure that the pest control company is aware of it before any termite treatment is done. The use of brand names in this publication does not imply endorsement by NC State University or N.C. A&T State University of the products or services named nor discrimination against similar products or services not mentioned.